NaturallySpeaking Speech Recognition Software Products for Legal, Government, Business, Office, or Home. Small Office and Home use products. Lite versions for simple dictation of letters and emails, full version for maximum productivity and application compatibility. Enterprise Solutions for Enterprise Applications. Powerful features for application compatibility and productivity for managment, line staff, legal and medical applications. Legal Vocabulary and contextual transcription for citations and other legal specific transcription styles. Full version of NaturallySpeaking. 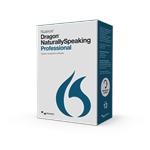 Dragon NaturallySpeaking 13 Professional is enterprise speech recognition software that lets users interact with PCs by voice —three times faster than typing — to drive productivity and cost savings.